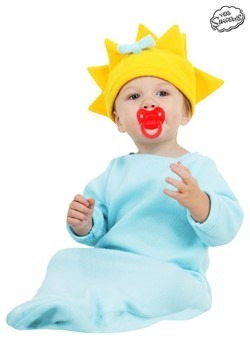 In December of 1989, a little show called The Simpsons made its humble beginnings. 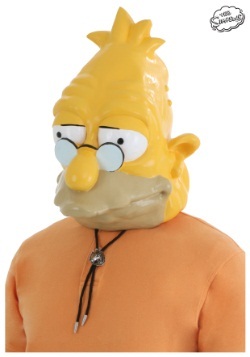 Homer struggled to find a Christmas gift for his family and ended up being the hero after finding Santa's Little Helper (not to be confused with Santos El Helper). 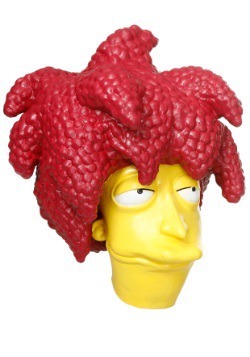 Close to 600 episodes, over a dozen Sideshow Bob murder attempts (that we know of) and who knows how many Duffs later, the show is still going strong. While the show has certainly changed, and a dozen writers have come and gone (Conan O'Brien totally needs to come back as a guest writer some time), we actually can't imagine a world without The Simpsons, nor would we want to. 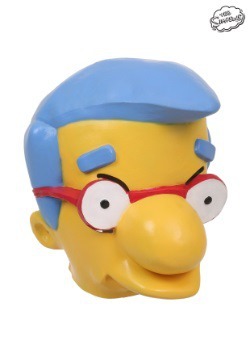 A world where everything DOESN'T come up Milhouse sounds like a terrible nightmare and we want no part of it. 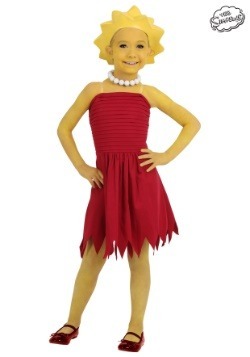 Of course, we never have to live in that world, since you can be a character from the show. 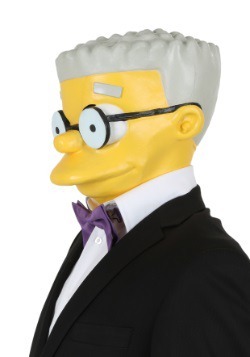 All you need is one of our Simpsons costumes or one of our costume masks, which we went to extensive lengths to make. You'll also need a few of our handy tips so you don't look like Ralph did in his "Idaho" costume. There are just so many characters to choose from! 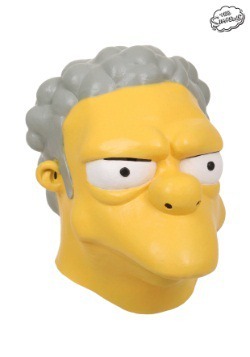 There's Moe Szyslak from the tavern, Flanders, Grandpa Simpson...they're all here! 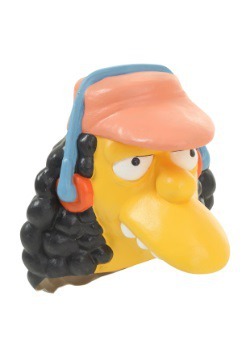 Even Otto! It can definitely be a daunting task selecting your favorite character, but we're here to help. We'll give you plenty of options to look at, along with some great quotes and even some couples costume ideas. Once you've read our guide, it should give you a good place to start. But if you want to be the life of the party, then there's really only one choice you can make, so let's begin there...with Duffman! Oh yeah! He's bold. He's brash. He's the ultimate party animal and he's also a corporate shill. He's Duffman! 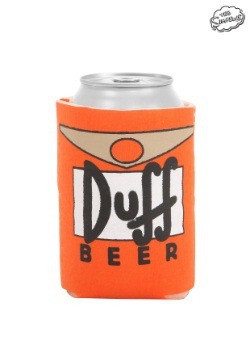 The legendary spokesperson of Duff Beer always shows up in Springfield when there's a new line of Duff products to push. You know...Duff Stout, Duff Light, Duff Blue, Duff Extra Cold, Lady Duff, and of course the new Duff Champagne, the beer of champagnes! 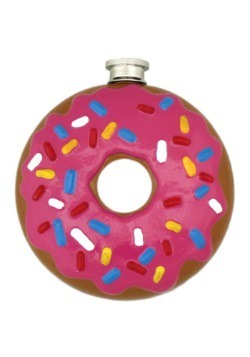 Whether he's ready to wet the whistle of Homer and Barney or party with the bikini clad girls at Springfield Beach, you can bet his bronzed body will be there to yell, "Oh Yeah!" 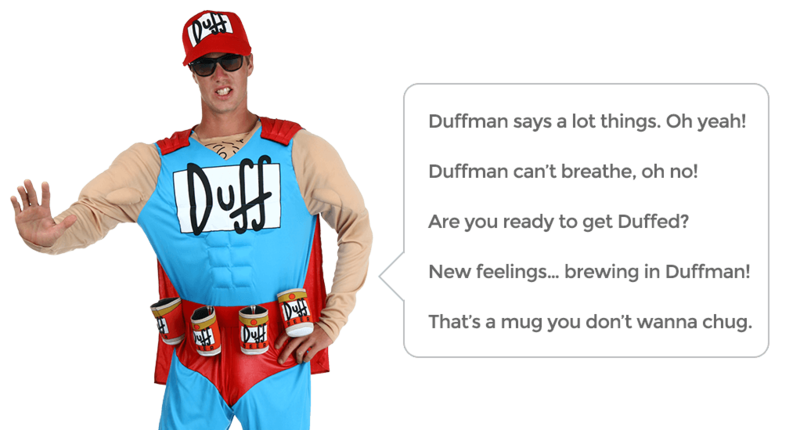 Check out these poses and quotes to get the most out of your Duffman experience. 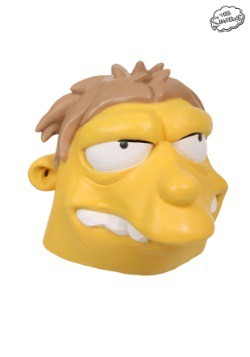 And remember—Duffman can never die, only the actors who play him! 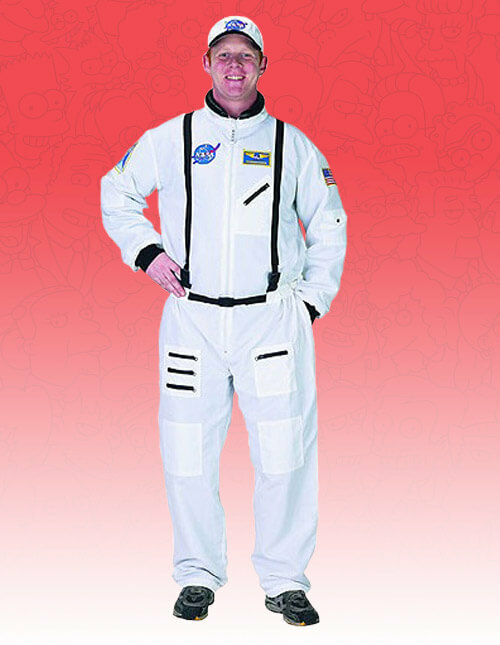 The first step to getting some great Duffman poses is this Duffman costume. 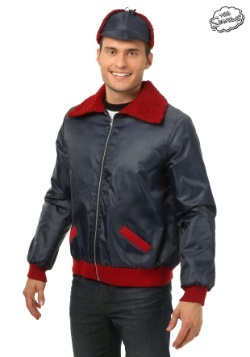 It comes licensed from the show, so all you need to bring with you is your unbridled enthusiasm for beer. DUFF Beer. That should be pretty easy, right? Then, take a look at some of these poses and get your smart phone or camera ready to make some shots for your social media pages. Duffman knows what the people want and he never denies them of it. What do the people want? If you've seen any episode of The Simpsons, that answer is quite obvious. More Duff Beer, of course! 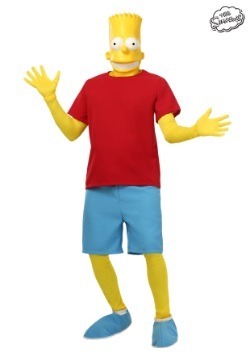 This pose tells the good citizens of Springfield that you've come to save the day and you've brought enough beer with you to keep the party going until the break of dawn. 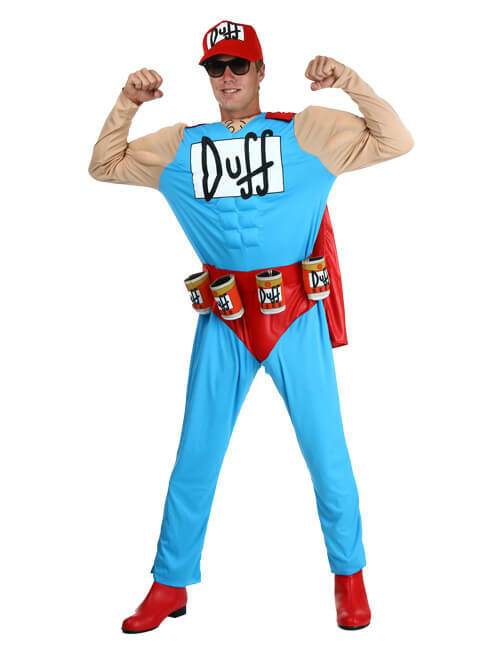 You can't get enough of that wonderful Duff, after all! 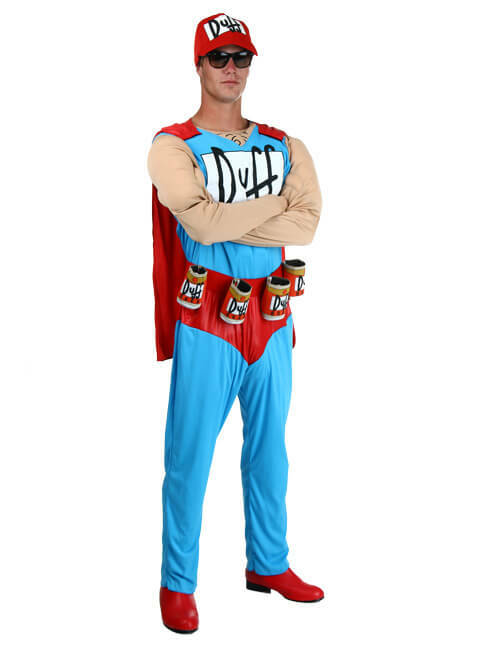 Duffman lives to serve...Duff Beer that is! 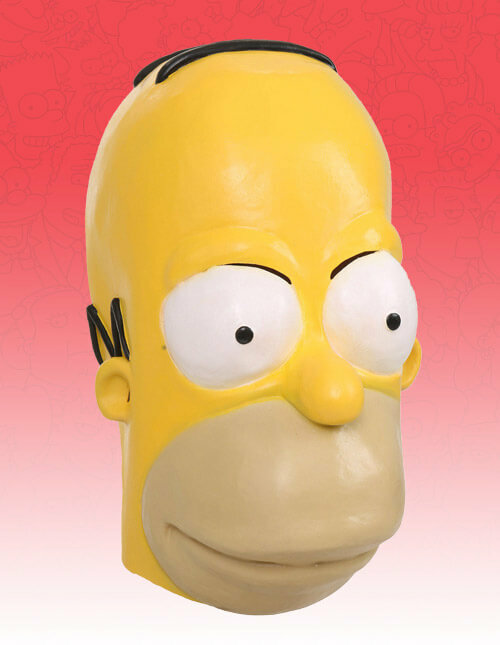 When Homer needs a refill on his favorite brew, you can bet that the only hero he wants to see is Duffman (or MAYBE Batman in certain circumstances). Just do this little pose when you make your big entrance into Moe's Tavern, or for when you want to spruce up your social media page. Holy moley! 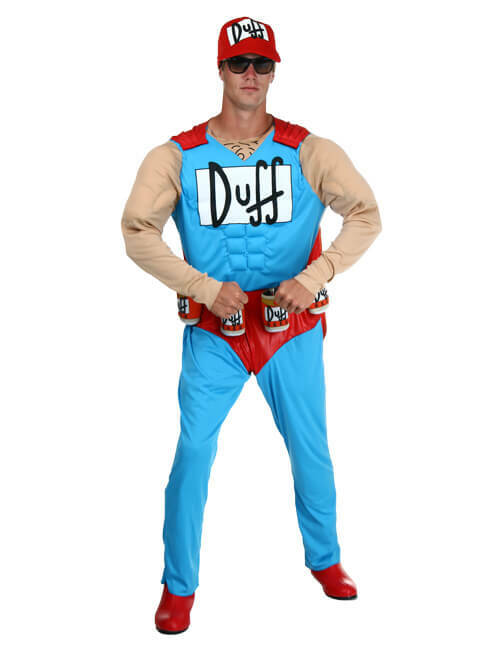 Is that how much Duffman gets paid? Where can we send our resume? 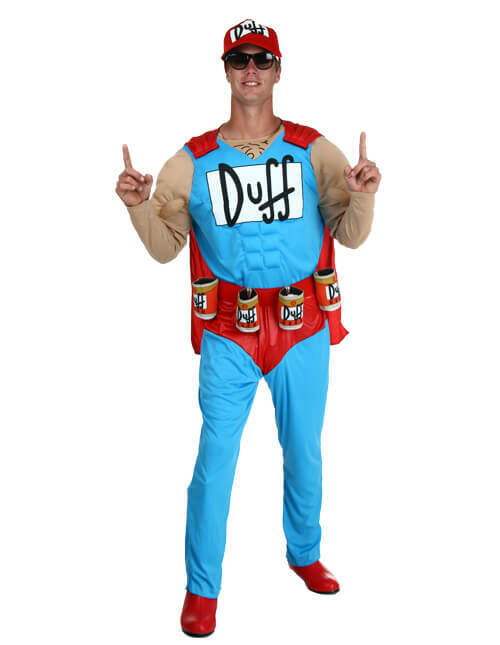 Unfortunately, just picking up this costume and wearing it to your next costume party won't net you that kind of wage, but we bet that if you send the Duff Beer Co. a picture of you in this pose, they're bound to hire you! (If you can ever actually find an address to send your application to, that is). Despite drinking copious amounts of beer, Duffman is always one cautious cat. We know because he said so! This pose is for when you want to show the world just how cautious you are. Or you could just throw caution out the window and party like a wild animal. You see, Duffman is a complicated man, full of philosophical contradictions...OH YEAH! You did it. You finally found that special someone who loves The Simpsons as much as you do. Now, it's time to share that combined love with the world. How? 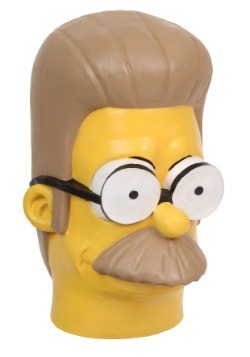 Well, with the power of Duffman and Duffwoman! 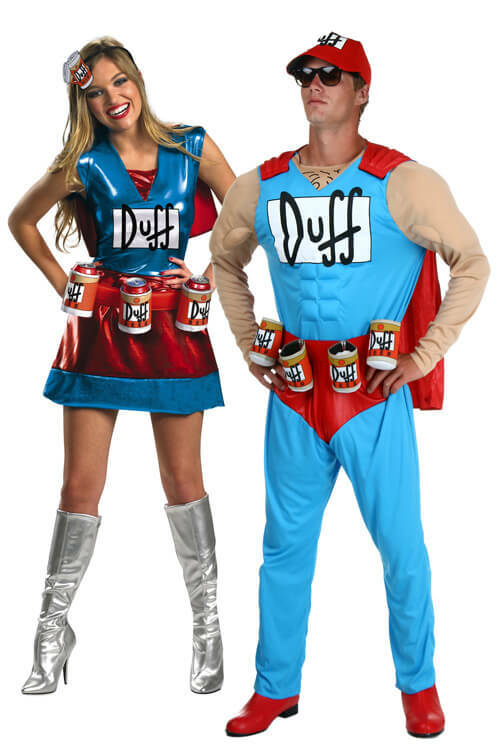 That's right, there's no better way to prove your love than the ever popular couples costume and this Duffman themed look is THE way to do it for a Simpsons themed look. Talk about a power couple! 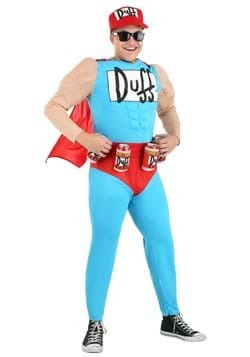 When the party is just too much for one hero to handle, even Duffman needs to call in a little help. 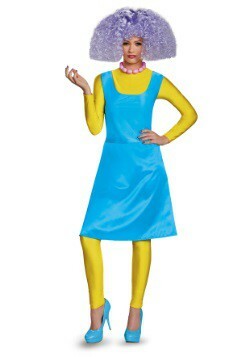 Although we've never met Duffwoman on The Simpsons, we know for a fact that she's just as awesome as Duffman himself. When you show up with your significant other dress as this superhero duo, all the party goers will think that they've begun to see double! 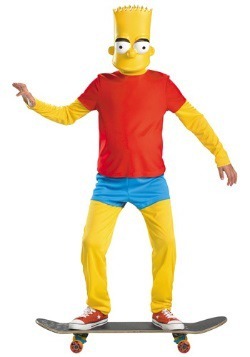 Both costumes are a unique take on the classic character. 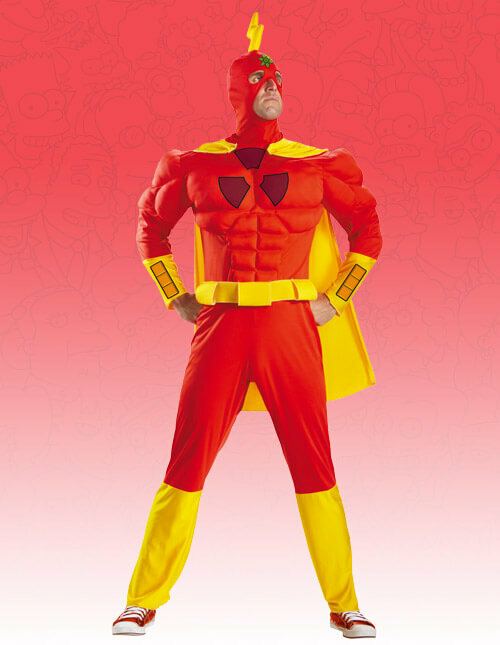 The men's costume comes with a bright red cape to make sure that everyone knows exactly how much of a hero you are, and some muscle padding designed into the chest and arms, just in case you don't have the time to commit to achieving the Duffman physique. 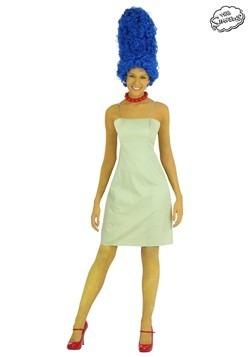 The women's Duffwoman costume puts a sassy spin on Duffman with a satin dress with a short skirt. 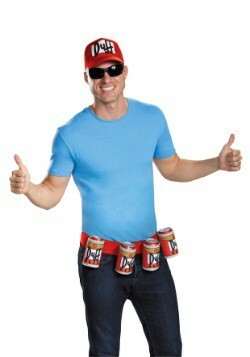 And since both costumes come with a beer holder belt, you'll never run out of Duff. You'll be the star of any party! The Simpsons is a show that has artfully mastered both smart and stupid humor to create iconic scenes. From carefully crafted punchlines that take a whole episode to set up, to Homer's pants falling off while he rides a tiny tricycle, each episode of The Simpsons is filled with memorable moments. Fans of the show get it. Don't believe us? All you have to do is walk up to a fan of the show, then shout, "Where's my elephant?" or "I was saying Boo-urns," and you'll be guaranteed a laugh. Reliving some of these moments and characters with a costume is a lot easier than you might think and makes for a great conversation starter at any party. 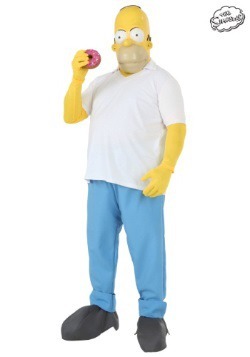 From the episode where Homer became an astronaut and clogged up the instruments with his ruffled chips, or that time that they filmed the live-action Radioactive Man movie right in Springfield, or even that time where Milhouse bought some Alf Pogs, these costume ideas should get the ball rolling. Ah, Krusty Burger. The official home of the Meat-Flavored Sandwich, The Clogger and the Deep Fried Krusty Burger. Mmm, Mmm! We can taste the high cholesterol already. It's Krusty the Clown's number one source of income and the number one lunch stop for any resident of Springfield. 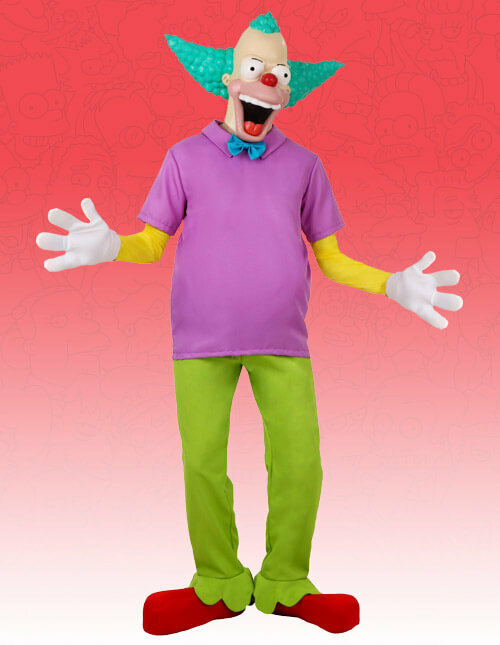 If you want to show your support for the fast food chain, all you need all you need to do is show up at local events and parties wearing this Krusty the Clown costume. 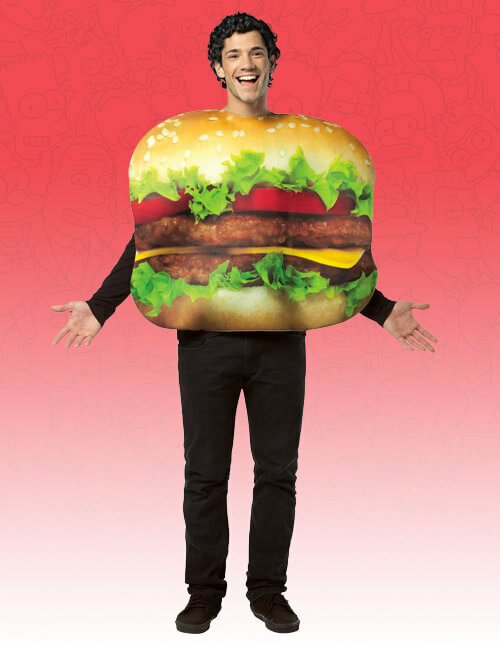 Make sure to bring a pal, dressed as a hamburger from the famous food joint. Then, you can tell everyone about Krusty Burger's Partially Gelatinated Non-Dairy Gum-Based Beverages! It's way better than any of those "shakes" that other places are selling. And, as always, keep an eye out for that pesky Krusty Burglar! Okay, so Homer Simpson might not be the most in-shape man in Springfield… or the smartest (how did he get his job as a Safety Technician again?) and maybe his hygiene isn't even the greatest either, but that didn't stop him from making the trip into outer space (with a little help from James Taylor, no less). 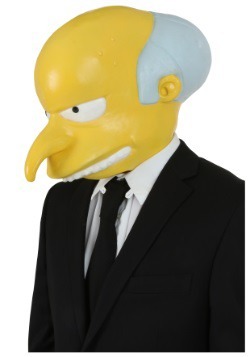 To recreate this classic moment from season 5, you need our licensed Homer Simpson mask and our astronaut costume. We recommend smuggling a bag of ruffled potato chips with you to get the full effect, but just make sure they don't clog any of the instruments when you break them out for snack time. And if you never make it into NASA's program, you can always try calling up Bill Clinton to ask him where all the Tang went. 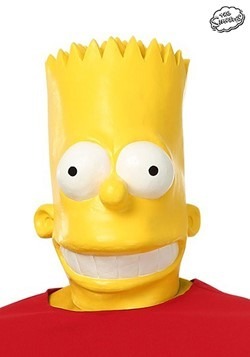 Criminy, how many times has Sideshow Bob tried to kill Bart now? We must be in double digits at this point. 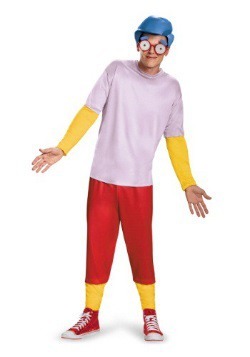 We really can't advocate murder on any occasion, but we really do like Sideshow Bob's character, so we highly advocate dressing like the character and talking like Kelsey Grammer. 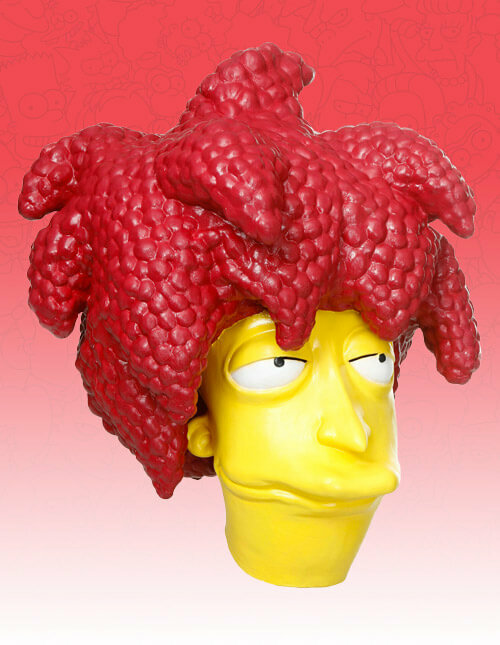 As it just so happens, we have a Sideshow Bob mask that will have even Krusty feeling a little uneasy. 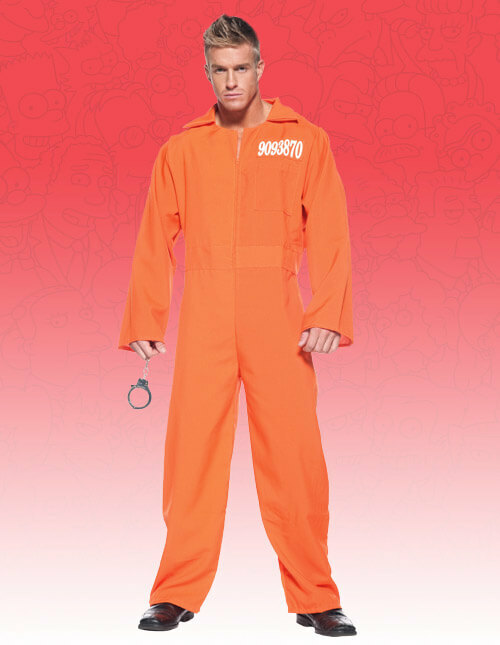 Of course, if you really want to get the full effect, you're going to need an orange prisoner outfit, since Bob is known for his many escapes from prison. Then you can go on concocting schemes to finally get revenge on Bart and you could even get your high-society brother to help you plan it. Muahahahahahahah! 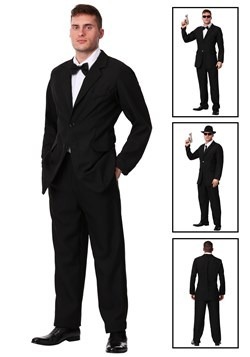 But please, for the love of all that is good, man, watch out for rakes when you wear this ensemble! 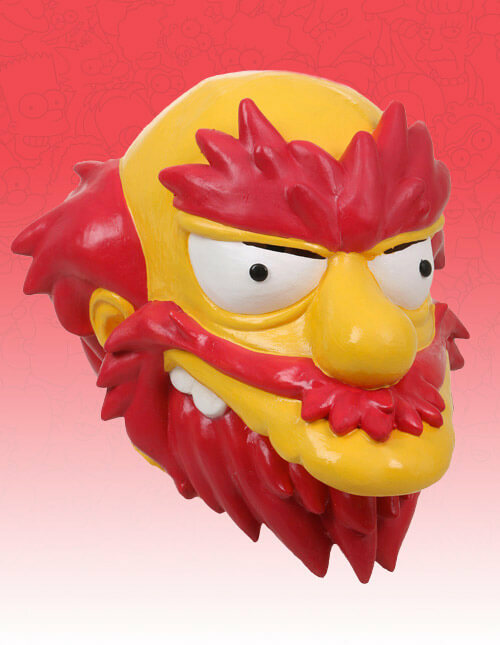 Groundskeeper Willie has it going on for a blue collar worker from Springfield Elementary. He's got a bikini model from Sweden for a girlfriend. He's in impeccable shape (Lunch Lady Doris can attest to that when she greased him up, so he could fit into the air ducts). He has a robust vocabulary and he once wrestled a wolf… and won. Heck, he's even quite the amateur filmmaker, even if most of his films are… a little strange and voyeuristic. His only real downfall is that darned Sheamus. 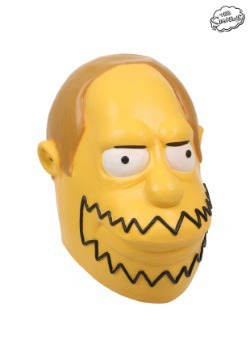 Now, you can show Sheamus who's the top Scotsman in Springfield by wearing this Groundskeeper Willie mask. 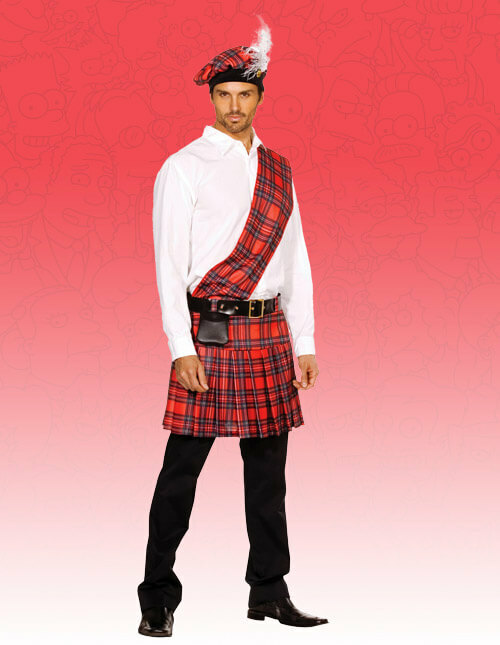 Don't forget to wear some traditional Scottish attire with it, since Willie wouldn't be caught dead wearing anything that didn't come from his native homeland, except for maybe his standard pair of overalls. Everyone knows that practical effects look way better on camera than phony CGI. Too bad for Rainier Wolfcastle that means he has to put himself right in harm's way. A deluge of toxic waste will be rushing toward him in a matter of minute. He shouldn't have to worry about his eyes though, since he has a nifty pair of goggles… Okay, so we all know now that the goggles do nothing. It's one of the most iconic moments in Simpsons history. 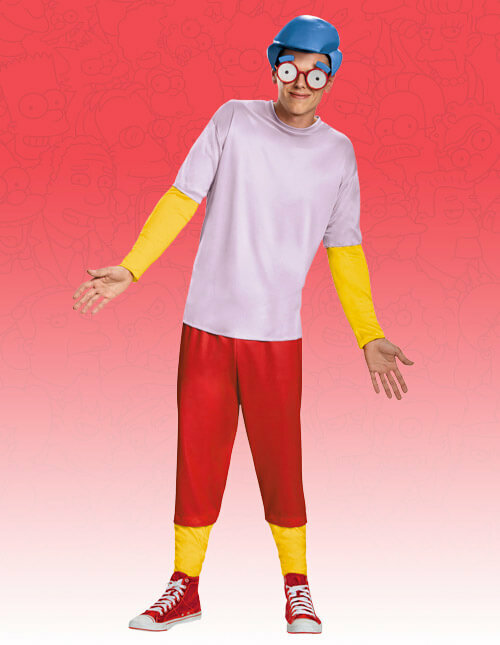 To recreate this outfit, all you'll need is our Radioactive Man costume, which is a bright red polyester costume with built in, Rainier-esque muscles. 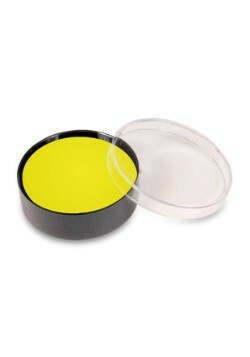 You'll also need a pair of our goggles and a funny, Eastern European accent. 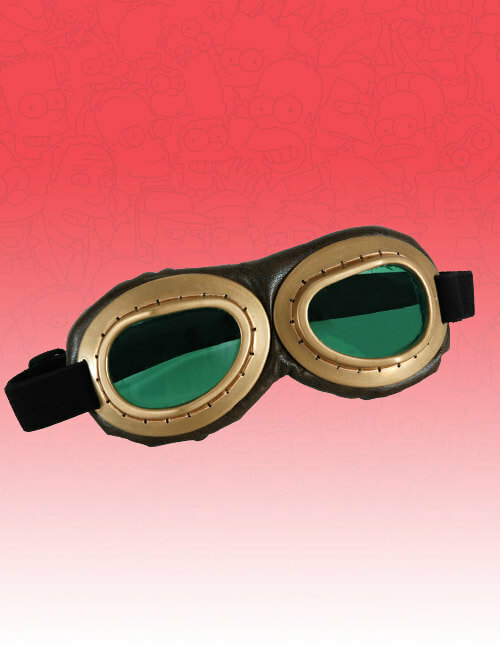 We can't recommend using these goggles to protect your eyes from radioactive waste, because, like the ones in the cartoon, these goggles do nothing (except they do look pretty cool). 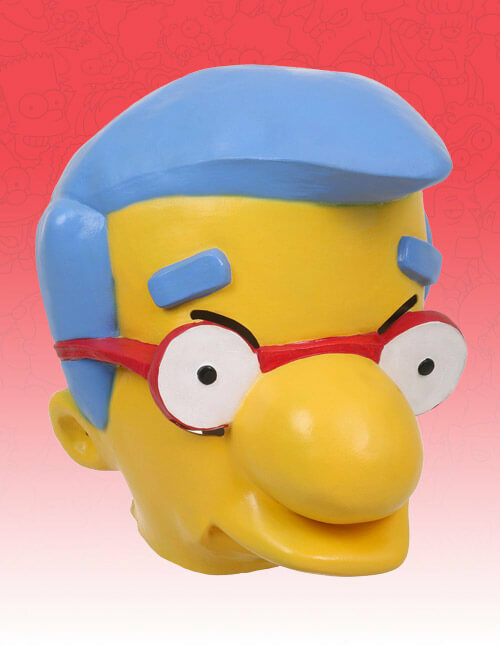 Make sure YOUR Fall Out Boy doesn't ditch on you like Milhouse did.